In the hospitality industry, one can’t succeed without teamwork. 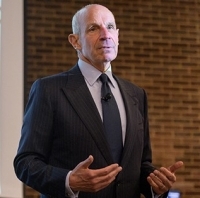 This was one of the messages Jonathan Tisch, chairman and CEO of Loews Hotels, co-owner of the New York Giants and more, shared with University of Delaware students recently as part of the Chaplin Tyler Executive Leadership Lecture Series at UD’s Alfred Lerner College of Business and Economics. 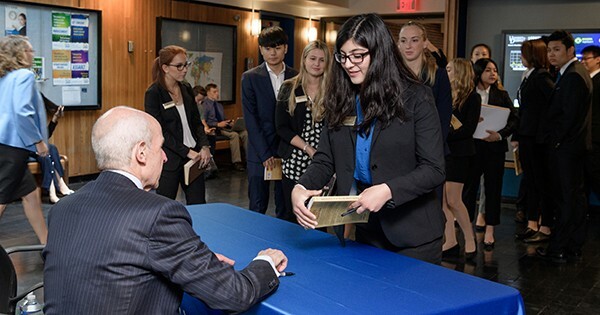 In a lecture entitled, “The Power of We: Lessons for the Hospitality Industry and Life,” Tisch emphasized the importance of working together, and about combining impeccable customer service with cooperation among business team members. Tisch said that he values the commitment that Loews employees make to the company, and that working in teams is what makes any person who works in hospitality successful. Even though Tisch has been the CEO of Loews Hotel’s for almost 30 years, he explained that he has committed himself to understanding every job in his business. Nearly 15 years ago, for example, he participated in a television show called Now Who’s Boss, which put CEOs back in entry-level positions in their companies. Tisch said that he was able to experience firsthand all the hard work that his employees put into their jobs, both physically and emotionally, and so he continues to institute a similar program today. “We now have ‘Who’s Boss Day,’ because I want our senior managers to have that appreciation of what the team means to us,” he said. Tisch also discussed his experiences growing up in the hospitality industry, having spent most of his childhood in the Loews Regency New York Hotel on 540 Park Avenue in Manhattan. He stressed the importance of being part of one’s community. When it comes to students seeking positions in the hotel industry after graduation, Tisch said that he knows that students may not always get their first-choice job right away. He views this as an opportunity for students to learn, though, and to expand their knowledge beyond their degree. The Chaplin Tyler Executive Leadership Lecture Series in UD’s Alfred Lerner College of Business and Economics brings leaders from business, nonprofit organizations and the public sector to campus to share their experiences and wisdom with students, faculty and the business community in an open exchange of ideas and perspectives. The series, which is supported by the Chaplin Tyler Endowment Fund, is dedicated to the memory of Chap and Elizabeth Tyler, their commitment to education and their determination to help young people achieve success in the business world.